The biggest ever British Rowing Junior Championships, presented by Visit Sarasota County ended under a blaze of glorious sunshine as records fell across the three day competition. A record number of entries saw over 1,500 junior rowers from 131 clubs race over the course of the weekend, the biggest entry since the Junior Championships began. The action got underway on Friday with the J14 omnium which saw rowers tested on their balance, manoeuvrability and technical rowing skills at multiple stations along the course. Skills tested included standing rigger dips, 360 degree spins, roll ups and a 200m slalom with emergency stop. All the rowers showed excellent control to navigate themselves through the omnium course with only a few rowers capsizing but always surfacing with a smile. After the omnium, J14 rowers raced over 1,000m in coxed quads to complete a fantastic day of racing. The J14 rowers weren’t short of medal winning inspiration with double Olympic champion Major Heather Stanning OBE popping in to say hi. Having recently retired from rowing to return to her career in the Army, Heather was down at the National Water Sports Centre with her Army colleagues to cheer on the rowers and showcase the career opportunities available to young people in the armed forces. On Saturday and Sunday it was time for the J15, J16 and J18 rowers. Action got underway at the National Water Sports Centre at 8am on Saturday and continued throughout the day with the final race going over the finish line at 7pm. Over 600 crews raced the time trial in the morning making it the biggest ever one day time trial at a regatta to have taken place in England, to date. In the afternoon, C/D/E finals were raced with lots of close and exciting racing over the 2,000m course. On Sunday afternoon, the sun shone on the A/B finals which saw outstanding performances by the rowers, cheered on by an enthusiastic crowd of supporters lining the bank. A hugely successful regatta for Henley Rowing Club saw them take home the Victor Ludorum for the second year running. For the first time ever, all the action from the British Rowing Junior Championships, presented by Visit Sarasota County was live streamed on YouTube bringing proud families and friends closer to the action. Off the water, the retail village was busy the whole weekend as rowers snapped up exclusive event merchandise, the latest rowing kit and equipment. 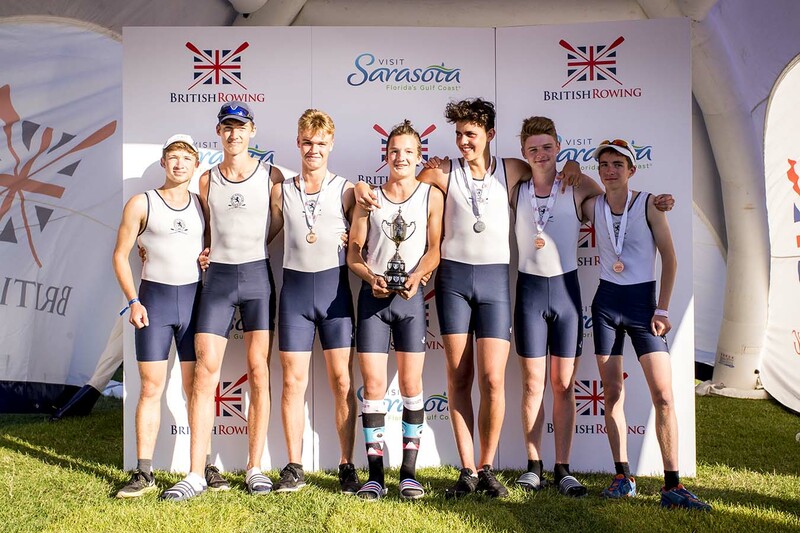 Title sponsor to the British Rowing Junior Championships, Visit Sarasota County where the 2017 World Rowing Championships are being held this September were keeping rowers and spectators feeling fresh with plenty of delicious oranges. Check out our Facebook page for more great photos from the event.